Advanced Compliance for Fire Marshall Specifications with Waterline Controls WLC6000-COLA2 Liquid Level Controls. Our most requested fire protection product is the WLC-FPT50 because it meets all the requirements for alarm points to the Fire Panel with a High alarm, service level and a low alarm point. However, there are also variations that we address. Recently, we built out a custom system to the requirements of a local Fire Marshall. He outlined that they wanted at least three valves, or preferably four valves, to operate sequential on and off. They wanted each valve to have its own set of sensor rods to turn off and turn on those individual valves. This means in a four valve system they would need eleven sensor rods for all the functions needed. With a Waterline Controls set-up it will need to be twelve. There would also be electrical connections for the fire panel and to allow for the direct operation of the valves. What we did is put two WLC-6000 controls together into one panel and brought all the connections into a single terminal block to make the connections easy and clear for the installers. This new Fire protection unit is called the WLC 6000-COLA2 and the controller is enclosed in a red 058a panel box. The fire protection Contractor submits to us the required lengths needed for his project and we cut them to length so we meet their needs. We supply a 4” fitting that fits into the top of the tank and allows for adjustment of the sensor inside that fitting. The 3” fitting the sensor fits into goes directly into this fitting with the adjustment sleeve. Typically, a contractor asks for the valves to be sequenced on with three inch differences between each on switch and off in the same manner. When working directly with a Fire Marshall who wants the controls to function in a specific way, a city inspector who is accustomed to seeing things done a certain way and a the needs of the contractor, it is challenging to get it all right. The most interesting point from the city inspectors is about what to make the internal static well out of – either galvanized or PVC Pipe. As it relates to the proper functionality of out electronic sensors, the type of material used for the static pipe is not relevant. However, there are some inherent issues that can arise when using galvanized pipe in these wet environments. Electrolysis degradation of the galvanized pipe caused either by dissimilar metal potential or stray electrical energy is a very real possibility when galvanized pipe is used. If a metal other than galvanized is touching the galvanized pipe the electromotive forces of the elemental difference can cause electrolysis. Stray electrical energy is unmanaged power “floating” around looking for a ground path. If for any reason this galvanized pipe is inadvertently connected to a better ground path than anything else, it will become the path to ground. In either case these situations potentially degrade the galvanized pipe over time. This deterioration could put unwanted metals into the water and require the pipe to be replaced often. Cutting the galvanized pipe and adding length or fittings exposes the ends. Whenever a piece of galvanized pipe is cut that cut end, whether threaded or just left as an exposed end, no longer has galvanized coating on it. No longer having a galvanized coating defeats the intended purpose of using galvanized pipe because that exposed end will now degrade faster since it is no longer coated. Turbulence in the environment could create some erosion or growth on the inside or the outside of the galvanized pipe and potentially interfere if the probes touch the sidewall of the static pipe. The erosion could cause the pipe to corrode and possibly degrade faster. The growth in the pipe could cause interference of the rods thereby defeating the functionality of the system. With all of the above being understood, we strongly recommend the use of PVC pipe to mitigate any issues that will arise from using pipe made from any other material. 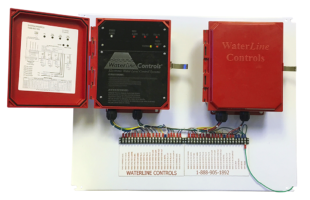 View all our Fire Protection Water Tank Level Controls and accessories.